Location: Brazil, India, the USA, the Czech Republic, Iceland and Morocco. Colour: A white transparent stone, or with a light green or brown color with black moss like inclusions. History/Mythology: Dendritic Agate is also commonly known as Tree Agate and is named due to the tree like inclusions that are commonly found in the stone. The word Dendritic comes from the Greek work ‘Dendron’ meaning tree. Artifacts have been found dating as far back as the Neolithic period caved in from this stone. All through history Dendritic Agate has been associated with nature, nature spirits and Goddess. In Greece it was associated with Dryads or forest nymphs in order to get a better harvest and was planted or buried in the fields before sowing the crops. In Roman is was associated with Artemis the Goddess of hunt and symbolized her place of dwelling the forest as well as Flora the Plant Goddess. In Russia it has been a symbol of long health and a life of prosperity. 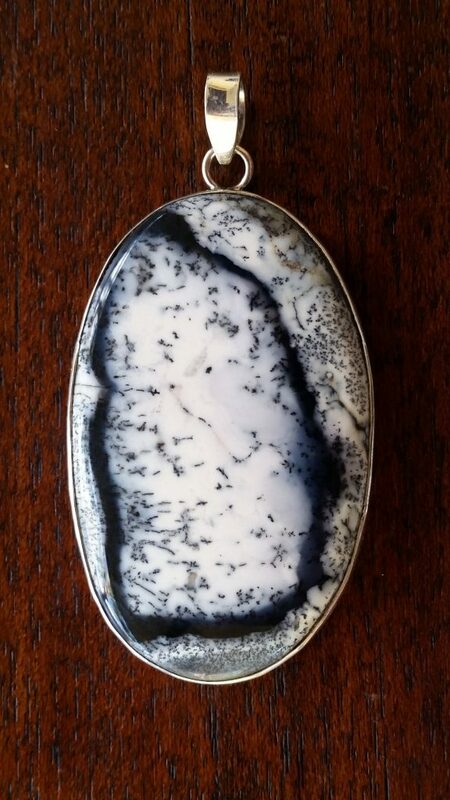 Dendritic Agate is strongly associated with abundance and is often called the ‘Stone of Plenitude’. The wonderful thing about Dendritic Agate is that it opens you up to receiving abundance in all areas of your life not just from a monetary aspect. It opens you to allow abundance in all areas of your life and receive them with gratitude and greater self confidence over being able to accept these gifts into your life. It also has an amazing ability to help transform all negative energies in both your surrounds as well as your body into positive ones. Dendritic Agate has a very deep seat connection to nature and allows you to reconnect to your surrounding environment is a calming grounding way. Dendritic Agate allows you to find the balance between our modern society and all of its downfalls and getting back to nature in order to reconnect. Healing – Dendritic Agate help with the aliment of the nerves and blood vessels, it assists with issues of the digestive and lymphatic systems and well as skeletal problems. It can be especially helpful with those suffering with neuralgia. Can be used in all meditations particularly when working on bring joy and abundance into your life. Placing a piece in your wallet or the money center of your house in order to allow abundance to manifest into your life. Worn in a piece of jewelry as a reminder that nature is all around us and that you need to reconnect. worn in a piece of jewelry to manifest abundance into your life and bring a peace and calming effect through.